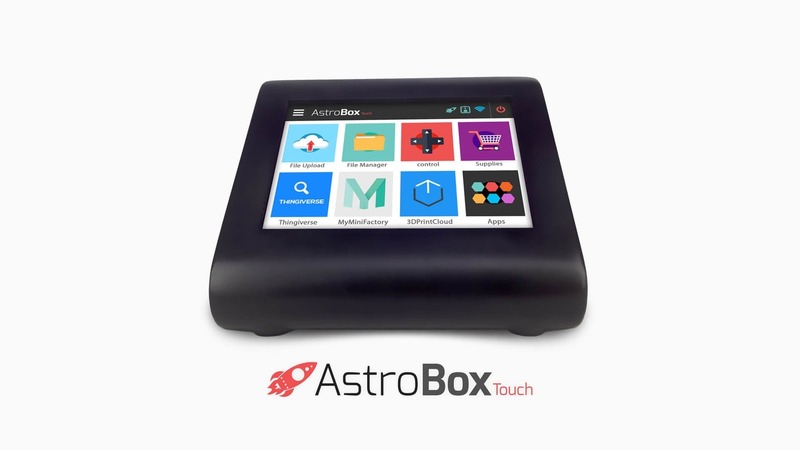 Previously the company marketed the AstroBox (no touch), which provided an easy means for you to connect an otherwise standalone desktop 3D printer to a powerful cloud environment, from which many interesting and useful functions became instantly possible. And that’s really what Astroprint is all about: maintaining a huge cloud network of 3D printing participants and functionality. The set-top boxes are simply gateways to that cloud. But the new version, the AstroBox Touch, is an extremely nice gateway. It’s designed to plug into your desktop 3D printer locally, but also connect to the Astroprint Cloud through your Internet connection wirelessly. From there you can control your desktop 3D printer remotely, as was the case with the previous AstroBox, but the new version adds a rather nice touch screen. This addition seems to magically transform your poorly equipped 3D printer into something new, like many recent machines that come with a touch screen of their own. The AstroBox Touch is specifically designed to be instantly usable, having no assembly required and only minor configuration required. You should be able to get it going in more-or-less plug and play mode. From there you will gain access to the extensive cloud services, and even be able to view 3D prints in progress if you add an optional webcam. The company is also releasing apps that will enable very easy remote use of the attached 3D printers. Of course, there aren’t any robot hands involved – yet – so there is only so much you can do remotely. But you can do all of that from these apps. The cloud is indeed powerful and I encourage you to check out all the amazing things you can do with Astroprint’s environment. This announcement is far more than just the availability of a new fancy set-top box, however. Since we will be using this open source framework for the AstroBox Touch — it is very developer friendly. 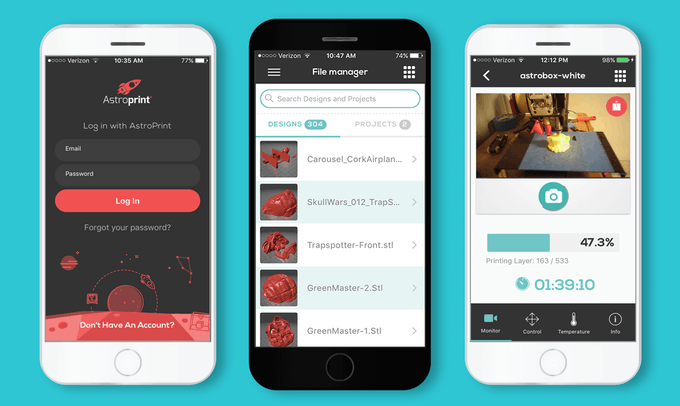 You’ll literally be able to make your app available to ALL of our users who own 3D Printers. You get the idea. This could be a very big deal. And Astroprint believes as one of the first to deploy such an environment, they will get an advantage over followers. How can you get involved? You might start by hitting their Kickstarter page where you can order one of their new AstroBox Touches. The cost is USD$100 and up, depending on volume. One thing to note: Astroprint offers subscription access to their 3D printing cloud environment, and Kickstarter backers will get a lifetime “Pro” subscription. This is normally a USD$10 per month value, so you could make your money back quickly. If You Want to Build a Hexapod, You’ll Want to Get a Stemi.